Your next steps depend upon what you're trying to do. 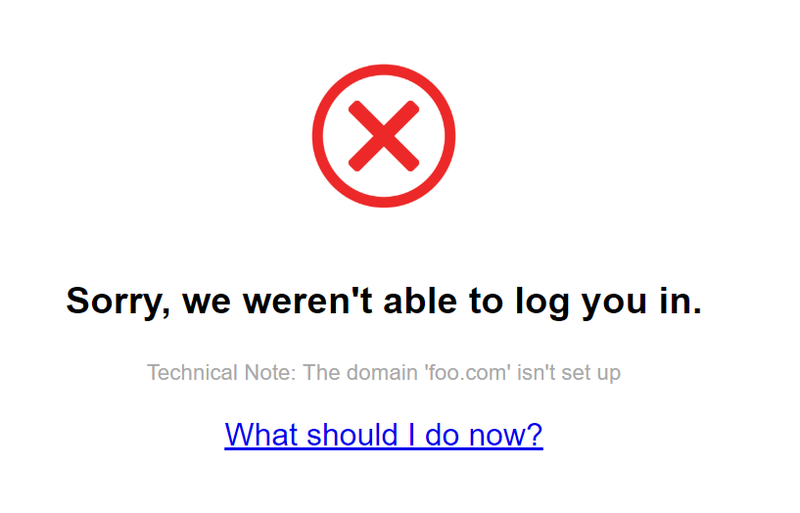 You've changed your primary domain name and are now locked out. The most likely reason for seeing this message is that you've not completely set Affixa up yet. Until that's been done, your users can't log in. If you've not installed Affixa from the G Suite Marketplace yet, take a look at our deployment guide and then visit the Marketplace to begin the installation. Complete the registration form and your should be all set up. If you use several domain names within your organization, you'll need to do some additional configuration. See the next section! You'll need an Affixa administrator to log into the Portal using a domain name that's already known to us. Once logged in, choose Domain Names in the left-hand menu. Then click Add Domain. You'll need to provide the new domain name and an email address belonging to an account on that domain. The email address must be a genuine account that uses that domain for its primary email address (i.e. it can't just be an account that uses the domain as an alias). We just use this email address to perform some pre-flight checks; we don't set that user up as an account holder. We'll check we can read the drafts folder and email signature for that account and, if successful, we'll add the domain to your account. If you've changed your primary domain name and can't access Affixa, get in touch via the contact link below. Let us know the old and new domain names and we'll fix up your account for you.